How long will your memory last? WHO’LL remember you in 70 years time? Who’ll know your name? What you achieved, who you loved, where you lived? Will anyone remember even one of the myriad details, events or landmarks that made up your life? How long will your legacy – such as it will be – last? “The most that most of us can hope to live on for, after our deaths, is 70 or 80 years. Can you remember your grandparents names? Where they came from or lived? These were questions put to me in a recent conversation I had with an associate, P.
He posed them as part of his argument for the need to live in the present, as a method to highlight the uselessness – the sheer cosmic unimportance – of the things most of us spend inordinate amounts of time considering, worrying about or planning. Focusing on our short, transient existence can be liberating for some, depressing for others; for more it’s a mix of both. 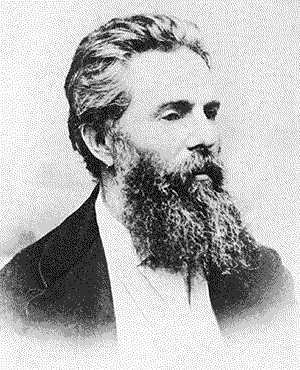 If we accept P’s argument it swiftly leads us to make a demand of ourselves: I must live as best and true and I can, for myself and others. Perhaps this living legacy is the only one that matters, the only immortality we can expect. And if it outlives us, more luck. Memorial to Ed Ricketts, Cannery Row, California. 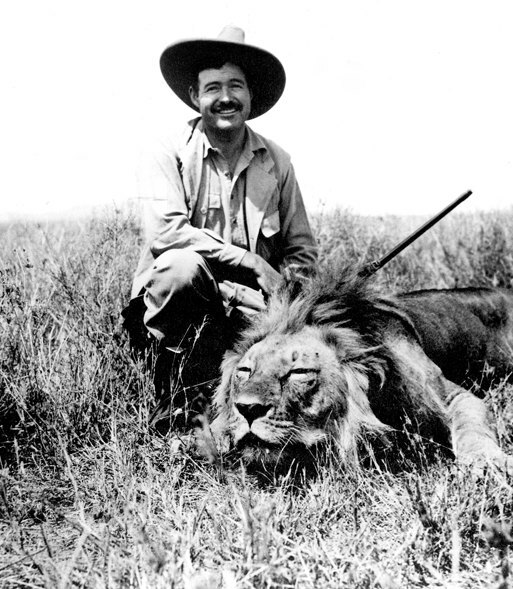 This occurred in recent days as I read excerpts from ‘About Ed Ricketts’, an essay written in memory of the marine biologist of the same name by his friend John Steinbeck. The work is an obituary, a love letter to friendship, to life, to hard work and hard relaxation, to enlightenment, to wine, to music and to all of us, to people. Ricketts, the inspiration for ‘Doc’ in the novel Cannery Row, had been killed in a car crash in 1948. 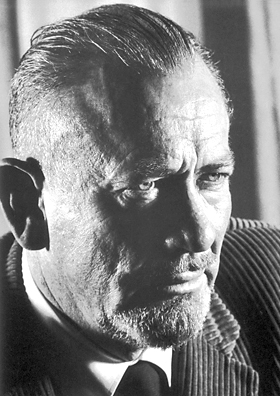 “He went a long way and burned a deep scar,” Steinbeck wrote, justifying his decision to write truly about his friend, a man who “had the faults of his virtues”. As legacies go being remembered like this, in the honest words of a friend, is as good as most of us can expect. And so Ed Ricketts, almost 70 years gone himself at this stage, had as good a shot at immortality as any. But in time he too will surely slip from public consciousness. 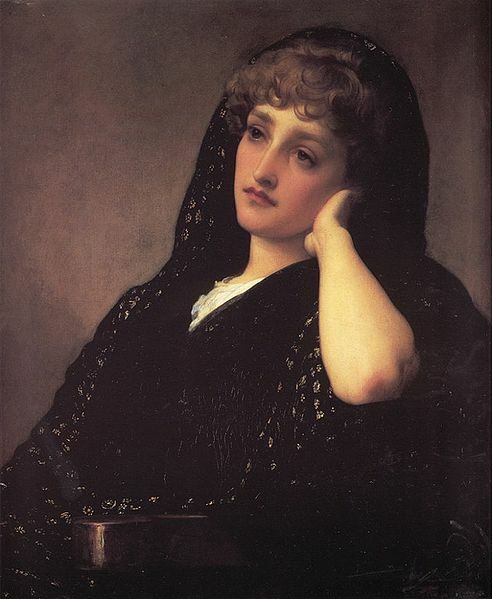 As for us, perhaps the best we should hope for is that we ‘go a long way’, do our best, and that people will remember. For how long? Does it matter? MY PATIENCE began to be tested on the third go-round. Walking the same aisles, seeing the same products, labelled with the same descriptions that I still couldn’t understand, I began to ask myself: is this really worth it? How far was I prepared to go to get the right kitchen condiment? The time was last Friday afternoon, the place Asia Market on Dublin’s Drury Street, and the task? 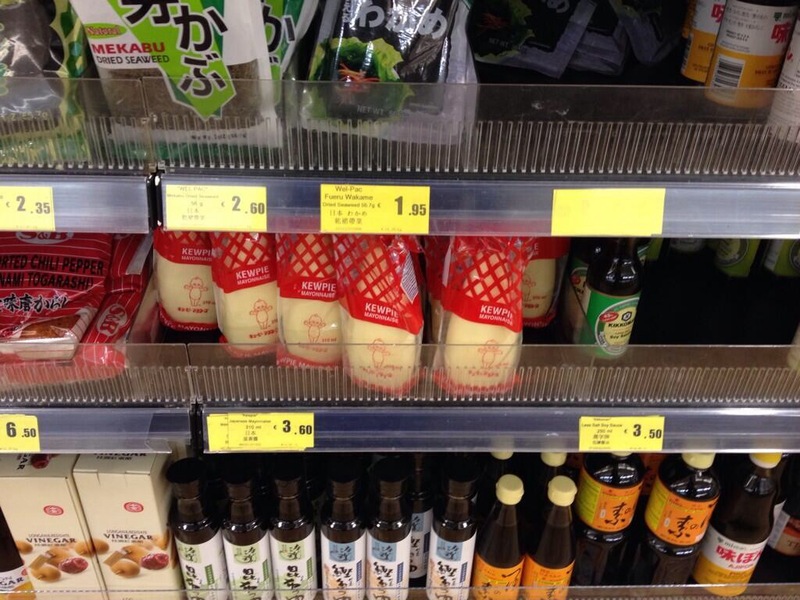 Finding Kewpie mayonnaise. I was sure I could do it unassisted but I was also certain that I needed to get home before midnight. Eventually I cracked and asked an assistant. Why Kewpie? Why not Hellmann’s or another brand of mayo? The Japanese product tastes the part but how much time was I prepared to devote to finding it in Dublin (where it’s stocked in a just a couple of specialty stores)? My trip last Friday had taken me a couple of kilometres across the city from one Asian grocery store to another, and had cost me the best part of the hour. Three stores and one day later: crab. For context: when it comes to regular shopping I usually lose the will to live after about ten minutes. Why is my attitude different when it comes to certain foods? I recall wading through a storm-struck Dublin last year to seek out just 100g of bresaola. Likewise my last trip for live crab saw me spend the best part of a day calling to fish shops in Marino, Howth and Abbey Street. I will drive for 15 minutes, and run up another ten parking and walking, to get the right kind of bread. Despite my usual shopping impatience none of these tasks bothers me in the slightest. I was thinking this over earlier last weekend when I received an email from my sister-in-law. 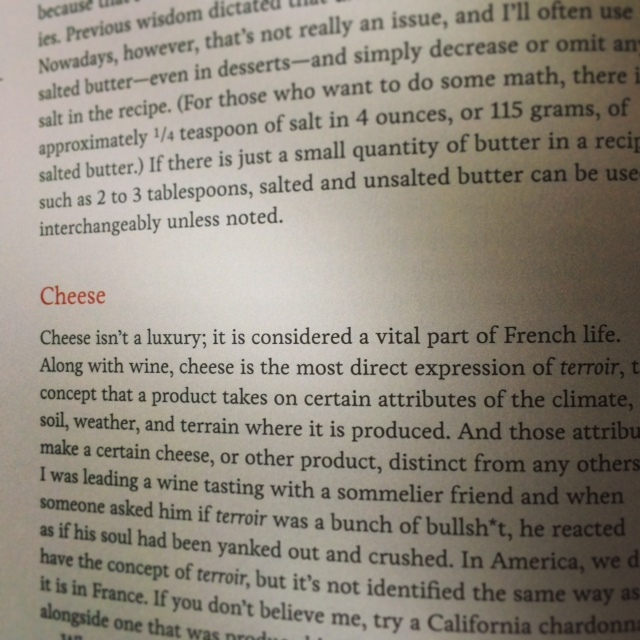 Anne had just bought David Lebovitz’s new book and sent my wife and I a pic of a paragraph therein on cheese. Lebovitz explains the importance of the foodstuff to the French, citing the concept of terroir – “the concept that a product takes on certain attributes of the climate, soil, weather and terrain where it is produced”. Lebowitz: he’s a terroir for the cheese…. Some argue this is solely a metaphysical concept, others (the French in particular) believe it’s in there, in the food on the plate. On foot of my wanderings I’ve come to believe it’s a bit of both. Was the bresaola more meltingly pungent because I’d battled storm-lashed streets to get it (rather than ordering it in restaurant)? Was the crab sauce softer and sweeter because of a three store trek (compared to getting it in one gourmet sandwich place)? Did the Kewpie on last weekend’s pancakes taste more vinegary than the last time I’ve had in an Asian eatery? Yes, yes and yes. Perhaps this is my version of terroir, a mixture of effort and taste, a physical and metaphysical culinary concept. The attention to detail needed to scope out hard-to-find ingredients, combined with their sensations on the tongue. It’s a sense of place, but also a way of eating, a method of appreciating. If you’re looking for it, it’s in Asia Market, halfway down the second aisle, second shelf. A load of crepes. Pancakes tasted good, once a year. Two words, like ‘low-fat sausage’ and ‘mid-strength Guinness’, that are enough to send most Irishmen running away in mortal fear – to the arms of their mammy or the local chip shop. For years I counted myself among them. I am part of a generation that was raised on cabbage one way – boiled. In salted water, if you were lucky. It was green and floppy and it was served with bacon. It filled you up and then you went back outside for another three hours of football. 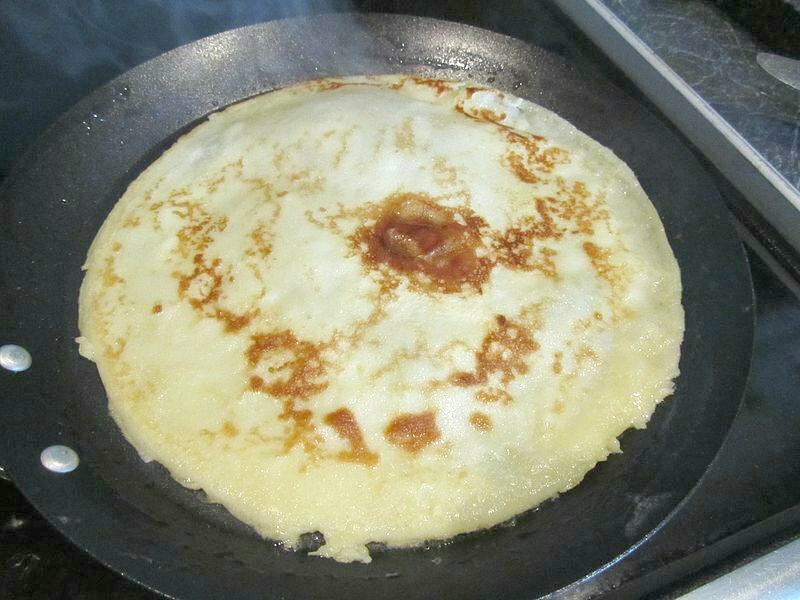 There were something we had once a year, crepe-style, on Shrove Tuesday. They tasted better than cabbage and bacon but they were such a rarity on our plate back then that we forgot they even existed for most of the year. Until that one February mealtime when we ate ourselves in a batter stupor. But cabbage and pancake on one plate? At the same time? Suggesting that in mid-1980s Ireland would have landed you some odd looks – and an instruction to finish the rest of those turnips (but that’s a post for another day). Fast forward to 2010 and I’m standing on Great Russell Street in London. After three hours wandering around the British Museum I’m hungry. Luckily my then-girlfriend-now-wife has sent me a recommendation – a cafe called Abeno on nearby Museum Street. And so followed my first experience with cabbage pancakes. 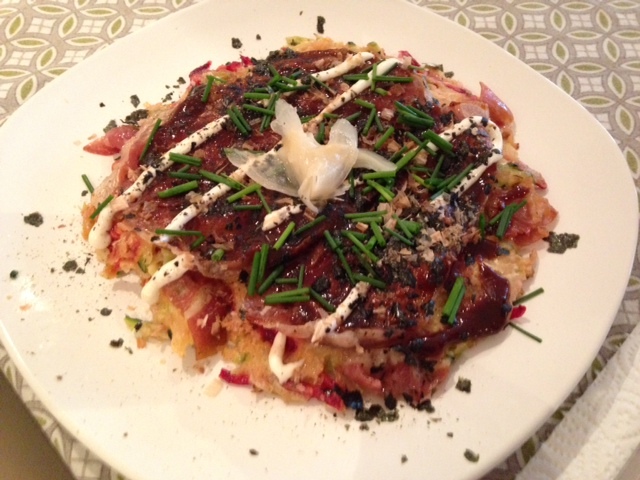 Or, as the Japanese call the dish, okonomiyaki. It turned out to be be more hands-on that I expected. 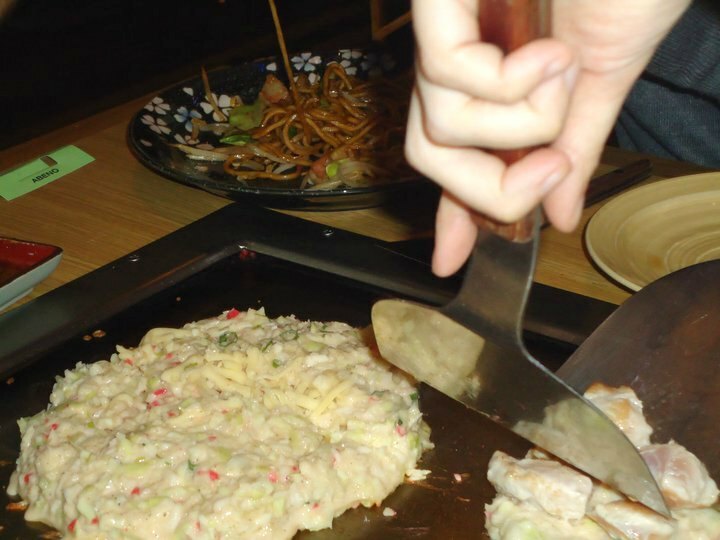 My table was a hot plate (or teppan), I was handed two spatula and presented with the mixed raw ingredients: cabbage, bacon, pork, in a flour and water batter. After a few minutes of pretending to know what I was doing I had something approaching okonomiyaki. Using the tonkatsu sauce to cover a multitude of culinary sins I sized up, and quickly inhaled my first cabbage pancake. Four years on I’ve eaten some incredible Japanese food, from the sushi served at my wife’s favourite spot in LA to sashimi overlooking the Pacific at Big Sur to, best of all, my mother-in-law’s New Year’s Day feast. Until last week, I never returned to okonomiyaki though. That changed when Clare, having come across an easy recipe for tonkatsu sauce, decided to put a spare head of cabbage to use. She shredded and mixed it with beetroot, courgette and prosciutto, producing a savoury pancake she topped with Japanese mayo and her homemade tonkatsu sauce. 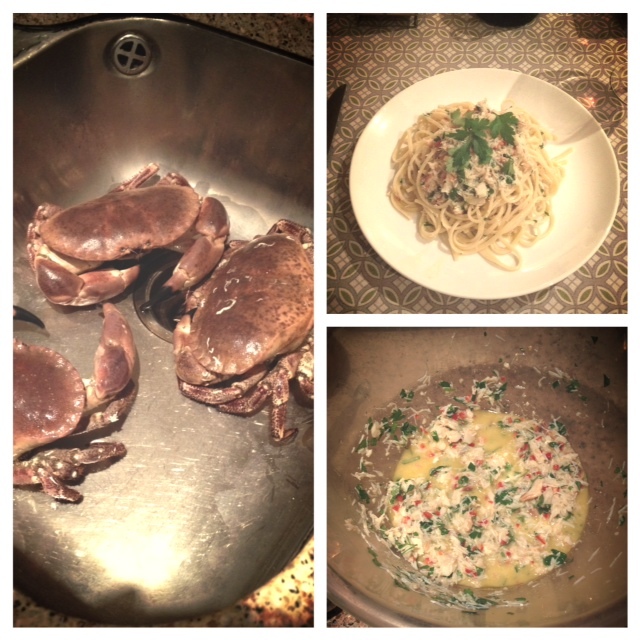 The result was the incredible comfort food – tangy, moreish, salty, substantial. And not unhealthy either. It was the answer to my hunger pangs, the Sunday blues, the question ‘what’s your death row meal?’ and, possibly, my dreams. In fact it left only one question. What would the six year old cabbage-eating me have made of it?